It’s a fact that most people have a hard time adding more protein to their diet. Amino acids from protein are the building blocks of muscles, tissues, and connective tissues — basically your entire body. Whether you’re a gym rat or just want to make sure you’re maintaining muscle mass as you age, you might want to consider adding some protein powder, or in this case — chocolate chip protein cookies to your weekly meal plan. These chocolate chip cookies are packed with protein and healthy fats, and free from inflammatory wheat flour and brown sugar. 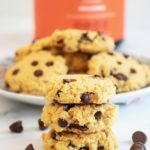 Add a weekly batch of these incredible chocolate chip cookies anytime you’re looking for a gluten-free, keto-friendly treat that also helps you meet your protein needs. The whey protein powder in this recipe supplies 4 grams of protein per cookie, so you can enjoy guilt-free. So whip up some of this high-protein cookie dough, and fill your kitchen with the delectable scent of chocolate chip cookies. Hippocrates said, “all disease begins in the gut.” And whey protein is fantastic for gut health. For instance, whey protein powder can help those with Crohn’s disease — a chronic inflammatory bowel disease that can affect the lining of your gut. When your gut lining becomes inflamed it can become more permeable; a condition often referred to as “leaky gut.” When a group of Crohn’s patients was given either glutamine (a single amino acid) or whey protein, they found that both groups showed significant improvements in gut permeability[*]. Coconut flour may also improve gut health. In an animal study, researchers gave mice coconut cake made from coconut flour to assess the effect on colon cancer cells. Coconut flour lowered the activity of specific enzymes responsible for cancer cell growth and might protect against colon cancer (at least in mice)[*]. Many chronic diseases are the result of too much inflammation in your body. Managing inflammatory pathways is vital to keeping your body happy and healthy. Egg yolks are a rich source of carotenoids, specifically the carotenoids lutein and zeaxanthin. These compounds are responsible for the brilliant yellow/orange color of egg yolks and have a host of health benefits, including their role as an anti-inflammatory. Lutein is such a potent anti-inflammatory that some researchers think it should be considered as a potential part of the treatment for cardiovascular disease[*]. Monk fruit is a natural sweetener often used in sugar-free recipes and low-carb products. A compound in monk fruit, mogroside, has been studied for its myriad of health benefits, including as an anti-diabetic and anti-cancer. One mice model found that mogroside was able to decrease inflammation in mice with ear edema (swelling). The researchers suggest that mogroside’s beneficial effect on cancer and diabetes may come from its anti-inflammatory properties[*]. Whether you’re trying to gain muscle, lose fat, or just fit into your jeans more comfortably, increasing your muscle mass is an integral part of staying healthy. Protein is an essential piece to the muscle growth puzzle, especially branched-chain amino acids (BCAAs). There are nine total essential amino acids and three of them have “branched-chain” chemical structures — leucine, isoleucine, and valine. BCAAs are well-known in the fitness and bodybuilding world for their ability to stimulate muscle growth. They can activate muscle synthesis following exercise by turning on specific enzymes[*]. Of the three BCAAs, leucine is the most powerful protein-muscle synthesis amino acid. Its effect is likely due to the upregulation of specific gene pathways which increase the rate of muscle growth[*]. All it take s is a few simple ingredients and a mixing bowl, and you’re on your way to your new favorite protein cookie recipe. For peanut butter chocolate chip cookies, add some peanut butter or nut butter drizzle or add a dollop to your batter. Add dry ingredients to a small bowl (whey, coconut flour, baking powder, xanthan gum, and salt). Whisk well to combine. Add butter/coconut oil and sweetener to a large bowl or stand mixer. Mix well until light and fluffy. Add egg, vanilla extract, and milk. Whisk well. Slowly add dry ingredients to wet ingredients. Mix well until dough forms. Portion and divide dough using a small cookie scoop. Place on baking sheet. Bake for 20-22 minutes until the bottoms of the cookies are lightly golden brown.